In July of 2015, the New Horizons mission made history by being the first spacecraft to rendezvous with Pluto. In the course of conducting its flyby, the probe gathered volumes of data about Pluto’s surface, composition, atmosphere and system of moons. It also provided breathtaking images of Pluto’s “heart”, its frozen plains, mountain chains, and it’s mysterious “bladed terrain”. Since that time, New Horizons has carried on to the Kuiper Belt for the sake of conducting more historic encounters. In preparation for these, the probe also established new records when it used its Long Range Reconnaissance Imager (LORRI) to take a series of long-distance pictures. These images, which have since been released to the public, have set the new record for the most distant images ever taken. At present, the New Horizons probe is at a distance of 6.12 billion km (3.79 billion mi) from Earth. This means that images taken at this point are at a distance of 40.9 Astronomical Units (AUs), or the equivalent of about 41 times the distance between Earth and the Sun. This it slightly farther than the “Pale Blue Dot” image of Earth, which was snapped by the Voyager 1 mission when it was at a distance of 6.06 billion km (3.75 billion mi; 40.5 AU) from Earth. This historic picture was taken on February 14th, 1990 (Valentine’s Day) at the behest of famed astronomer Carl Sagan. At the time, Sagan was a member of the Voyager imaging team, and he recommended that Voyager 1 take the opportunity to look back at Earth one more time before making its way to the very edge of the Solar System. For more than 27 years, this long-distance record remained unchallenged. However, in December of 2017, the New Horizons team began conducting a routine calibration test of the LORRI instrument. This consisted of snapping pictures of the “Wishing Well” cluster (aka. the “Football Cluster” or NGC 3532), an open galactic star cluster that is located about 1321 light years from Earth in the direction of the southern constellation of Carina. This image (shown above) was rather significant, given that this star cluster was the first target ever observed by the Hubble Space Telescope (on May 20th, 1990). While this image broke the long-distance record established by Voyager 1, the probe then turned its LORRI instrument towards objects in its flight path. As part of the probes mission to rendezvous with a KBO, the team was searching for forward-scattering rings or dust. As a result, just two hours after it had taken the record-breaking image of the “Wishing Well” star cluster, the probe snapped pictures of the Kuiper Belt Objects (KBOs) known as 2012 HZ84 and 2012 HE85 (seen below, left and right). These images once again broke the record for being the most distant images taken from Earth (again), but also set a new record for the closest-ever images ever taken of KBOs. As one of only five spacecraft to travel beyond the Outer Planets, New Horizons has set a number of other distance records as well. These include the most-distant course-correction maneuver, which took place on Dec. 9th, 2017, and guided the spacecraft towards its planned flyby with the KBO 2014 MU69. This event, which will happen on Jan. 1st, 2019, will be the farthest planetary encounter in history. In the course of its extended mission in the Kuiper Belt, the New Horizons team seeks to observe at least two-dozen other KBOs, dwarf planets and “Centaurs” – i.e. former KBOs that have unstable orbits that cause them to cross the orbit of the gas giants. At present, the New Horizons spacecraft is in hibernation and will be brought back online on June 4th, – when it will begin a series of checks to make sure it is ready for its planned encounter with MU69. The spacecraft is also conducting nearly continuous measurements of the Kuiper Belt itself to learn more about its plasma, dust and neutral-gas environment. These efforts could reveal much about the formation and evolution of the Solar System, and are setting records that are not likely to be broken for many more decades! In 1655, astronomer Christiaan Huygens became the first person to observe the beautiful ring system that surrounds Saturn. And while they are certainly the most spectacular, astronomers have since discovered that all the gas and ice giants of the Solar System (i.e. Jupiter, Saturn, Uranus and Neptune) have their own system of rings. These systems have remained a source of fascination for astronomers, largely because their origins are still something of a mystery. But thanks to a recent study by researchers from the Tokyo Institute of Technology and Kobe University, the origins of these rings may be solved. According to their study, the rings are pieces of Dwarf Planets that got torn off in passing, which were then ripped to pieces! This research could help to resolve many of the burning questions about the ring systems around our system’s giant planets, as well as details about the Solar Systems past. For the sake of their study – titled “Ring Formation around Giant Planets by Tidal Disruption of a Single Passing Large Kuiper Belt Object” – the Japanese team of researchers considered a number of factors. First, they considered the diversity of the various ring systems in our Solar System. For instance, Saturn’s rings are massive (about 100,000 trillion kg!) and composed overwhelmingly (90-95%) of water ice. In contrast, the much less massive rings of Uranus and Neptune are composed of darker material, and are believed to have higher percentages of rocky material in them. To shed some light on this, the team looked to the Nice Model – a theory of Solar System formation that states that the gas giant migrated to their present location during the Late Heavy Bombardment. This period took place between 4 and 3.8 billion years ago, and was characterized by a disproportionately high number of asteroids from Trans-Neptunian space striking planets in the Inner Solar System. They then considered other recent models of Solar System formation which postulate that the giant planets experienced close encounters with Pluto-sized objects during this time. From this, they developed the theory that the rings could be the result of some of these objects getting trapped and ripped apart by the gas giants’ gravity. To test this theory, they performed a number of computer simulations to see what would happen in these instances. The results of these simulation were consistent with the mass of the ring systems observed around Saturn and Uranus. This included the inner regular satellites of both planets – which would have also been the product of the past encounters with KBOs. It also accounted for the differences in the rings’ composition, showing how the planet’s Roche limits can influence what kind of material can be effectively captured. This study is especially significant because it offers verifiable evidence for one of the enduring mysteries of our Solar System. And as Hyodo points out, it could come in mighty handy when it comes time to examine extra-solar planetary systems as well. In the meantime, some might find the idea that ring systems are the corpses of Dwarf Planets troublesome. But I think we can all agree, a Soylent Green allusion might be just a bit over the top! 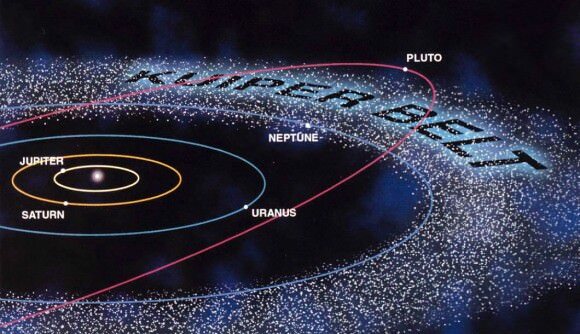 The Kuiper Belt has been an endless source of discoveries over the course of the past decade. Starting with the dwarf planet Eris, which was first observed by a Palomar Observatory survey led by Mike Brown in 2003, many interesting Kuiper Belt Objects (KBOs) have been discovered, some of which are comparable in size to Pluto. And according to a new report from the IAU Minor Planet Center, yet another body has been discovered beyond the orbit of Pluto. Officially designated as 2014 UZ224, this body is located about 14 billion km (90 AUs, or 8.5 billion miles) from the Sun. This dwarf planet is not only the latest member of the our Solar family, it is also the second-farthest body from our Sun with a stable orbit. The discovery was made by David Gerdes, a professor of astrophysics at the University of Michigan, and various colleagues associated with at the Dark Energy Survey (DES) – a project which relies on the Cerro Tololo Inter-American Observatory in Chile. In the past, Gerdes’ research has focused on the detection of dark energy and the expansion of the Universe. Towards this end, DES has spent the past five years surveying roughly one-eighth of the sky using the Dark Energy Camera (DECam), a 570-Megapixel camera mounted on the Victor M. Blanco telescope at Cerro Tololo. This instrument was commissioned by the US. Dept of Energy to conduct surveys of distant galaxies, and Dr. Gerdes had a hand in creating. Not surprisingly, this same technology has also allowed for discoveries to be made at the edge of the Solar System. Two years ago, this is precisely what Gerdes challenged a group of undergraduate students to do (as part of a summer project). These students examined images taken by DES between 2013-2016 for indications of moving objects. Since that time, the analysis team has grown to include senior scientists, postdocs, graduate and undergraduate students. This was a difficult process. In addition to needing thousands of computers at Fermilab to process the hundreds of terabytes of data, the team had to write special programs to do it. Gerdes and his colleagues also relied on help from Professors Masao Sako and Gary Bernstein of the University of Pennsylvania, who contributed the key breakthroughs that allowed them to perform difference imaging over the entire survey area. In the end, dozens of new Trans-Neptunian Objects (TNOs) were discovered, one of which was 2014 UZ224. According to their observations, its diameter could be anywhere from 350 to 1200 km, and it takes 1,136 years to complete a single orbit of our Sun. For the sake of perspective, Pluto is 2370 km in diameter, and has an orbital period of 248 years. “The object’s brightness in visible light alone depends both on its size and how reflective it is, so you can’t uniquely determine one of those properties without assuming a value for the other. Fortunately there’s a solution to that problem – the heat the object emits is also proportional to its size, so obtaining a thermal measurement in addition to the optical measurements means we would then be able to calculate the object’s size and albedo (reflectance) without having to assume one or the other. Gerdes and his team expect to be busy, authoring the paper that will detail their findings, using the ALMA array to get more assessments of 2014 UZ224 size, and sifting through the data to look for more objects in the Kuiper Belt. This includes the fabled Planet 9, which astronomers have been seeking out for years. Given its distance from the Sun, 2014 UZ224’s orbit would not be influenced by the presence of Planet 9, and is therefore of no help. However, Gerdes is optimistic that the evidence of this massive body is there in the data. Given time, and a lot of data-processing, they just might find it! In the meantime, this newly discovered object is likely to be the focal point of a lot of fascinating research. In 2014, Scott Sheppard of the Carnegie Institution for Science and Chadwick Trujillo of Northern Arizona University proposed an interesting idea. Noting the similarities in the orbits of distant Trans-Neptunian Objects (TNOs), they postulated that a massive object was likely influencing them. This was followed in 2016 by Konstantin Batygin and Michael E. Brown of Caltech suggesting that an undiscovered planet was the culprit. Since that time, the hunt has been on for the infamous “Planet 9” in our Solar System. And while no direct evidence has been produced, astronomers believe they are getting closer to discerning its location. In a paper that was recently accepted by The Astronomical Journal, Sheppard and Trujillo present their latest discoveries, which they claim are further constraining the location of Planet 9. For the sake of their study, Sheppard and Trujillo relied on information obtained by the Dark Energy Camera on the Victor Blanco 4-meter telescope in Chile and the Japanese Hyper Suprime-Camera on the 8-meter Subaru Telescope in Hawaii. With the help of David Tholen from the University of Hawaii, they have been conducting the largest deep-sky survey for objects beyond Neptune and the Kuiper Belt. Their most recent discovery was a small collection of more extreme objects who’s peculiar orbits differ from the extreme and inner Oort cloud objects, in terms of both their eccentricities and semi-major axes. As with discoveries made using other instruments, these appear to indicate the presence of something massive effecting their orbits. All of these objects have been submitted to the International Astronomical Union’s (IAU) Minor Planet Center for designation. They include 2014 SR349, an extreme TNO that has similar orbital characteristics as the previously-discovered extreme bodies that led Sheppard and Trujillo to infer the existence of a massive object in the region. Another is 2014 FE72, an object who’s orbit is so extreme that it reaches about 3000 AUs from the Sun in a massively-elongated ellipse – something which can only be explained by the influence of a strong gravitational force beyond our Solar System. And in addition to being the first object observed at such a large distance, it is also the first distant Oort Cloud object found to orbit entirely beyond Neptune. And then there’s 2013 FT28, which is similar but also different from the other extreme objects. For instance, 2013 FT28 shows similar clustering in terms of its semi-major axis, eccentricity, inclination, and argument of perihelion angle, but is different when it comes to its longitude of perihelion. This would seem to indicates that this particular clustering trend is less strong among the extreme TNOs. Beyond the work of Sheppard and Trujillo, nearly 10 percent of the sky has now been explored by astronomers. Relying on the most advanced telescopes, they have revealed that there are several never-before-seen objects that orbit the Sun at extreme distances. And as more distant objects with unexplained orbital parameters emerge, their interactions seem to fit with the idea of a massive distant planet that could pay a key role in the mechanics of the outer Solar System. However, as Sheppard has indicated, there really isn’t enough evidence yet to draw any conclusions. Alas, we don’t yet know if Planet 9 is out there, and it will probably be many more years before confirmation can be made. But by looking to the visible objects that present a possible sign of its path, we are slowly getting closer to it. With all the news in exoplanet hunting of late, it is interesting to see that we can still go hunting in our own backyard! In the outer reaches of the Solar System, beyond the orbit of Neptune, lies a region permeated by celestial objects and minor planets. This region is known as the “Kuiper Belt“, and is named in honor of the 20th century astronomer who speculated about the existence of such a disc decades before it was observed. This disc, he reasoned, was the source of the Solar Systems many comets, and the reason there were no large planets beyond Neptune. Gerard Kuiper is also regarded by many as being the “father of planetary science”. During the 1960s and 70s, he played a crucial role in the development of infrared airborne astronomy, a technology which led to many pivotal discoveries that would have been impossible using ground-based observatories. At the same time, he helped catalog asteroids, surveyed the Moon, Mars and the outer Solar System, and discovered new moons.